Les Revenants is a thematic exhibition that brings spirit photography – pictures of invisible beings – into contemporary art. Barbara Astman’s dancing with Che (2002-3) brings the charismatic revolutionary to life in a suite of photographic performances. 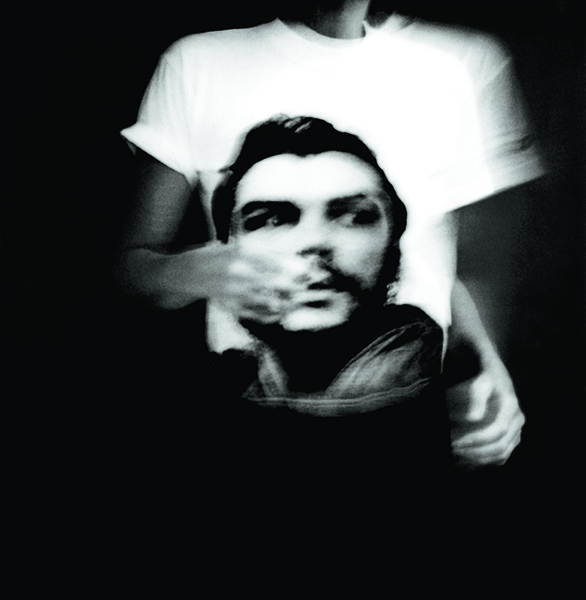 Che Guevara’s portrait is printed on the artist’s T-shirt; he moves as she moves. Astman, Hiebert, Jolly, and Stephenson suggest that there are unseen forces sustained by hopes and beliefs which can be documented photographically. Barbara Astman has exhibited in solo and group exhibitions in Canada and internationally since the early 1970s. Her work is held in public collections in Canada, the United States, and Europe. Astman has an Associates Degree from the Rochester Institute of Technology, School for American Craftsmen, and an AOCA from the Ontario College of Art. her public art projects include site-specific work for the Canadian Embassy in Berlin. She is a professor in the Faculty of Art at the Ontario Colleg of Art & Design and is represented by the Corkin Shopland Gallery, Toronto.